Mix sugars, cornstarch, salt, cinnamon and nutmeg in 4-quart Dutch oven; stir in water. Heat to boiling, stirring frequently; reduce heat. Cook stirring constantly, until thickened and bubbly, about 5 minutes. Stir in juice. Pack hot jars 1/2 full with apple slices. Pour on enough hot syrup to cover slices; remove air bubbles with rubber scraper. 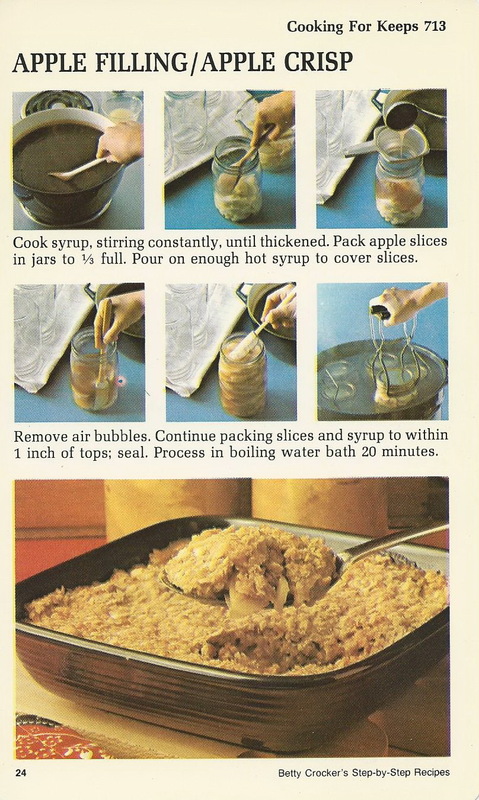 Continue packing jars 1/3 at a time with apple slices and syrup. When filled within 1 inch of tops, seal. Process in boiling water bat 20 minutes. 6 Quarts. Heat oven to 375°. Spread Apple Filling in greased baking dish. 8x8x2 inches. Mix remaining ingredients; sprinkle on filling. Bake 35 minutes. 6 servings. Looks yummy! I enjoy these old recipes and pictures.